I opened my charts 30min after the open, and for the 3 hours I traded, scaling in and out of positions while using a trailing stop worked good. I normally do bad on Mondays, so I'm pleased with todays performance. I missed a trade on CL because the risk looked a little too big for the contract size; however I should have instead bought USO to lower my risk and still have taken the trade. I'm not sure if it was my computer, internet connection or IB, but my fills on book trader topk 2-3 seconds to get filled when normally I get filled instantly, I'm guessing it's my internet connection considering I'm sharing a line with 2 other computers now. 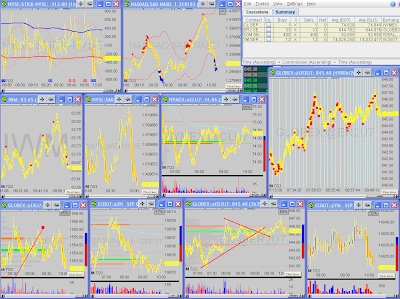 I've been exploring platforms for option trading and for back-testing strategies. I liked Tradestation's Option analyzer, and I've been wanting to try out Tradestation for a long time to back-test some strategies, so I think I'm going to open an account with them. 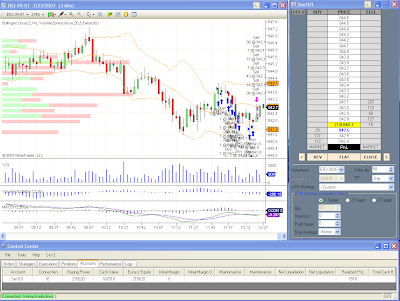 I'm testing out NinjaTrader right now. It's not as cool as I thought, and as of right now I like QT and IB book trader 10x more. The Stocks for Home buidlers and real estate continue to trend down and China continues to trend up,,,,how long has this been going on for?